Stop the rats, wild birds, and other vermin from stealing your feed and spreading disease. Cut your feed bill in half! Shipping rates have skyrocketed thanks to Amazon squeezing the three main carriers. For cheaper shipping use the multi pack. Or send us a label. Is it hard to train the chickens to use it? Do you have chickens and rats? Or chickens and wild birds that are eating more feed than the chickens? Here is the solution. But before you buy look for the different versions of our feeder, this is the original version, there is a soft close version, an exterior version, and a soft close exterior version. There are also multi packed feeders that can lower the shipping costs down to as low as $9 to $12.00 each depending on how many and distance. We have a lot of customer submitted videos too that show the feeders in use, most from customers with feeders that are two, even three years old. Look for the different versions of our feeder, this is the original version, there is a soft close version, an exterior version, and a soft close exterior version. There are also multi packed feeders that can lower the shipping costs down to $9 to $12.00 each. This is a duplicate page used to track Facebook incoming traffic and it won't have reviews for quite awhile so please check the other Medium Rat Proof Feeder (Item # F-MED) to read all the reviews. There won't be any reviews for a while as this is a brand new product page, only about one out of twenty customers will leave reviews even on purchases they liked, so please read the reviews on the very popular medium feeder by clicking on this link.. The medium rat proof treadle chicken feeder hopper holds 26 pounds of laying pellets or other feed and has a 100% galvanized sheet metal feed tray and hopper so the feed flows easily and sanitation is assured. Generally a laying hen eats around 4 ounces of feed per day, so one pound of feed should feed four birds one day, 7 pounds per week per four birds, or 3 1/2 weeks per full hopper of feed for a four hen flock. The feeder is designed and marketed for full size birds. If you have bantams or other than full size birds please read our FAQ section on our main website by clicking on this link. There is a lot of info on that web page including videos. Here is at recent review on this product. The lady had rats tunneling under her coop causing structural damage, saved 20% per day in feed costs for 25 hens, and is getting three to four extra eggs per day, which probably meant that the rats were eating that many eggs or were stressing the hens enough to impact egg production. I ordered 2 feeders. They're easy to assemble and look like they'll be easy to clean, although none of the birds are hanging out on top of them. I attached the wood mounting block to the back of the feeder and screwed two heavy-duty hooks into the top of the block. The hooks hang on the inside of the chain link fence that supports the open-air chicken coop. This causes the feeder to tilt forward a bit, so I'm planning to add a bumper near the bottom to correct the tilt. I recommend training the chickens when you can spend a few hours with them over two days. They were scared of the sound of the door closing and would run away. I stood in the coop and would catch a hen, place her on the treadle and let her eat. Then I'd remove her, let the door close, and place her back on the treadle. I did this repeatedly with all the brave girls and the not-so-brave girls would watch and then eat from the sides. When I saw one girl jump on the treadle, I left the coop. I repeated this the next day to make sure multiple girls were jumping on the treadle. Make sure there is no other food available because they won't learn if they're not motivated by hunger. I'm using finely-ground feed. I haven't had any issues with bridging, probably because the hens rock the feeder when they jump on the treadle. I'm feeding 25 birds with 2 feeders and all of them appear to be getting enough to eat. I've seen 4 hens eating at the same time, but usually I see 3. My coop recently became overrun by rats that dug through heavy clay under the apron of my coop. I think one or more got caught inside the coop when the automatic door closed so they spent the night digging out. The tunnels were causing structural damage because they tunneled under weight-bearing blocks. Judging by the extensive network of tunnels radiating 40-50 feet from the coop, there were many rats. I installed the rat-proof feeders and poison bait stations at the same time because rats will chew on the chickens' feet if they don't have anything else to eat. The feeders and bait stations have been in place for just over two weeks and we've noticed this past week that the tunnel entrances in the coop aren't active any more and are being filled in by the chickens scratching the dirt. We're even getting 3-4 more eggs a day. I'm assuming the rats were stressing the chickens, which reduces egg output. I'm using 20% less feed and getting more eggs, so I'm very happy with the new feeders! The shipping on the feeders isn't cheap because they are two cubic feet and weigh 15 pounds. Local states should cost $16.00 to $21.00 and the furthest states will run up to $25.00 or $28.00. Sales channels like Amazon or Ebay have cheaper freight on items but what most customers don't realize is that sellers are forced to bury around half of the cost in the price of the product! If the seller is selling Prime/Fulfilled by Amazon (FBA) they pay the inbound shipping AND out bound shipping. We used to sell on Amazon Market Place and the maximum shipping allowed for a fifteen pound product is $12.00, half the cost of the actual shipping to California or to the East Coast. Then there is another $12.00 in selling fees (including 15% of the ultra low shipping costs!) so the sales price on Amazon had to be $24.00 higher to cover the hidden fees. We sell on Ebay the cost is around $15.00 more to cover the additional costs. We feel that the fairest way is to charge the actual shipping and set the price of the actual feeder as low as possible. If you are from Hawaii or Alaska it is cheaper to use U.S. Post Office Priority mail. Their parcel post rates are not competitive with FedEx Ground here in the continental states unless the state is nearby but a feeder to Alaska or Hawaii can be shipped for around $50.00. The easiest way is to go to the USPS.com website and generate your own shipping label, then either print and scan it, right click on the actual label when it shows up on the screen and "save as", or just save the label as a PDF. Email the label to us, pay the cost of the product using PayPal using [email protected] as the PayPal address and your package will go out the next business day. International orders must be handled through a forwarding service as the paperwork is quite burdensome for even a small package. Search online for package forwarding services, they will accept packages in your name, then bundle everything together and process the paperwork for exporting. Alternately, have the product shipped to a friend in the U.S. and take it back with you in your luggage when you visit. One thing to consider on international sales is that you can pack about five to nine pounds of additional product into the inside cavity of the feeder, most forwarders will consolidate packages if you ask, just make sure it will fit inside. One of the most common problems is when a flock owner blocks open the feeder door for a few days because they have read online that it is required to train the birds. You should never, ever, block the treadle when training birds to use the feeder. We warn about this on our website because what you have done is teach the birds that the treadle is not supposed to move. The grandpa type feeders have to do this because the door swings up into the bird's face instead of swinging back away but if you read reviews on the guillotine type feeder it takes weeks for the birds to learn to use them. Make sure the feeder is securely fastened to a wall or post and that the treadle is bottom out on something solid so the bird can stand on the ground with one foot and have the other foot holding down the treadle. The other thing to avoid is having other sources of food available for the birds. That means nothing, no scraps, no treats, no free range, just the feed in the feeder if you want them to learn quickly. Lastly the third most common mistake is to allow the birds to eat their fill when you show them the feed during training. Let them eat for just a few seconds, enough to know that food is in the feeder. You want them hungry so they gather up the courage to step on that treadle! Please give us some feedback on the shopping cart after your birds have learned to use the feeder. Just visit the shopping cart web page where you ordered the feeder and place a review. The system should recognize you or you can sign into your account to leave the feedback. Feedback really helps new customers decide if the feeder is right for them and it helps us to learn what needs improved and what we are doing right. Remember that repair parts are always available if you should ever need them. Springs tend to be a wear item but they are cheap to replace. Email us at [email protected] if needed. Training Instructions: Thank you for the purchase of our feeder. Thousands of these feeders are already in use but it helps if a new flock is trained correctly from day one. If your package of hardware is nowhere to be seen take the feeder outside on a concrete or other hard surface and drop it a few inches straight down, sometimes the hardware bag gets stuck up behind the front cover when the feeder is turned upside down during shipping and handling. If all else fails, remove the two screws in the front cover and see if it is jammed up there. Sometimes the door crank hole is plugged with extra paint, just shove the wire through to clear the excess paint. Email us at [email protected] if needed. Will they be afraid of the new feeder? Yes, chickens are prey animals; see how their eyes are on the sides of their head instead of in front like a predator? Binocular vision is for predators, side vision for prey so they have a wider field of view. Chickens are skittish by nature, it is in their genes, and they are wary of new things and things that move. Just a shadow flicking by overhead will make them run in panic even as chicks, it is genetically embedded knowledge, not experience. But if you start a flock off by showing them that the door is supposed to move when they step on the treadle and wait till they are hungry the birds will learn to use the feeder in one day. After the birds go to roost at night you make sure the feeder is installed, fastened to a wall or sturdy post, and is full of feed. Then remove ALL other feed sources except the feeder. No scraps, no treats, nothing but what is inside the feeder. The next morning wait till about two to three hours after sunrise and show the birds where the feed is by using your toe to trip the treadle. WHEN they are hungry enough one of them will try stepping up on the treadle. Let her eat for ten to fifteen seconds then gently push her off to see if she will try it on her own. If not, repeat the lesson. Usually one bird will try the feeder as soon as you show them where the feed is located. IF the birds are hungry they will mob the feeder. If they are not hungry they will remain skittish of this object that they thought wasn't supposed to move when they used it. Don't spend a lot of time that first training session, a couple of minutes is enough if they are hungry. Go back in a couple of hours and repeat the lesson. Check on them again before they go to roost. Check again the next morning a few hours after sunrise. Packed inside the feeder is a plastic bag containing two short bolts, four fender washers, two ¼” nuts, three ¼” lock nuts and one spring. One 4” diameter counterweight, and one treadle assembly is packed at the top of the package. The wire link connecting the door to the treadle is taped to the side of the feeder. Your feeder was assembled and tested, then disassembled and packed for shipping. Set the feeder in the upright position. Put one of the large fender washers on a bolt then reach inside the swinging door into the feed tray and insert the bolt through the side of the feeder, add one large fender washer and one ¼” nut on the outside. Do the same for the other side then tighten the nuts firmly using a wrench or crescent wrench. Place the counterweight bolt in the end hole of the right side treadle arm using one of the lock nuts. Just snug it up to prevent breaking the concrete counterweight. The small metal pin sticking out of the counterweight should be on top of the treadle arm to keep the counterweight from swinging down. Place the treadle arm assembly over the bolts protruding out from the sides of the feeder while making sure the counter weight is on the same side as the door crank and add one lock nut on each side. Tighten the lock nuts down lightly then back it off 1/8th turn so that the treadle will move freely. You will have to bend the treadle arms to line everything up and tweak it so nothing rubs. Insert the wire link with small bent end into the hole in the end of the door axle crank rod and stick the large L bend end through the right side treadle arm Bend both ends of the wire link down and underneath to keep link from popping off then clip off the excess wire on the bottom end. Not too tight that it binds and prevents the door from opening. If the swinging door doesn’t open up all the way back take a pair of pliers and put a kink in the wire link till the swinging door opens all the way back. All you are doing is shortening the wire link by putting a kink in it. If the counterweight bolt rubs the side of the feeder, bend the treadle arm out slightly till it clears. Hook the long end of spring over the top of the feeder side and using pliers pull it down and hook it under the wire link. Be careful working with the spring, watch your eyes! Pull the spring down, not up, in case it breaks. If you have small chickens you can just use the spring, remove the concrete counter weight. The feeder should be fastened to a wall or post for stability. There is an 1 ½” thick recycled wood spacer included, set the feeder in place and mark where the wood spacer should go, screw the spacer to the wall, put the feeder back in place, and run a couple of screws through the side of the feeder into the wood spacer. 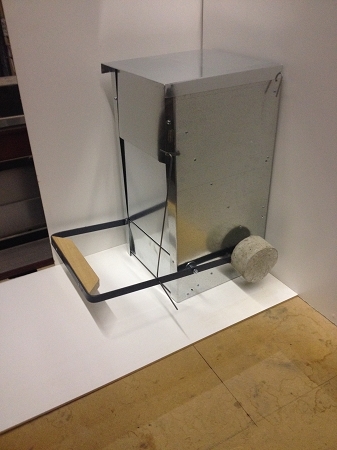 The feeder can be fastened to a plywood base if it needs to be freestanding. Fasten the wooden block to the plywood base, then put a couple of screws through the side of the feeder. Make sure the feeder is securely fastened to a wall or post and that the treadle is bottom out on something solid so the bird can stand on the ground with one foot and have the other foot holding down the treadle. Usually the lid must be pushed to one side to get it to close completely. Email us at [email protected] if you have any problems, send pictures please! Don’t call, email with pictures so we can see the problem! Returns ARE accepted for shipping damage that is not easily repaired by the customer and we are talking about a five minute fix using a screw driver and wrench, popping out a dent by hand, or simply tweaking the door. Let us know by email the same day your feeder arrives, take a few pictures of any damaged and email them to us so we can start the claim process with our shipper. In about two business days we can email you a return shipping label and as soon as that label shows up in the FedEx Ground system as being picked up we can re ship a replacement product. Returned feeders that have been opened are destroyed, not resold, due to the risk of disease being spread so it is an expensive process to allow returns, but if it is OUR fault or the SHIPPERS fault we will take care of the problem. Once a customer opens the box and starts the assembly process the risk of spreading disease has started as the customer might have disease organisms on their hands from handling their flock. Returns ARE NOT accepted if you change your mind about the purchase, for lost hardware, for minor dents that can be popped out by hand, cosmetic damages, or someone expecting a Steinway Piano at Wal Mart prices. If you have OCD spend the $225.00 for the Grandpa feeder or better yet sell your chickens and use the money for visiting a shrink. Also if your chicken died before the feeder arrived, too bad, buy a new chicken. Or if the shipping damage can be repaired using a screw driver and wrench we will send you replacement parts. In four years we have had one welded door axle fail and a couple of stripped screws, both five minute fixes using a Philips screwdriver and a wrench. Hardware bags break loose on occasion and nuts or washers get lost, for that we will mail you a replacement hardware bag. Sometimes the bag gets stuck up behind the front cover and can be seen by peeking under the cover or smacking the feeder down hard on a floor to dislodge the bag. As the years go by we offer free replacement parts such as springs or hardware, as long as it isn't something like a side panel or back panel that has rusted out after years of use. All you do is pay for the postage for delivering the parts. Don't set galvanized metal on alkaline soil is one tip and the average chicken coop has a lot of ammonia present that can accelerate rusting of even galvanized steel if you don't keep the poop away from the bottom of the feeder. Install it as we recommend and the feeder will last for many years. We do not allow returns of used feeders for any reason due to the risk of spreading diseases. If you have not followed our instructions and your birds aren't using the feeder that is not a cause to return the feeder. Follow the instructions, all chickens are nervous by nature, few are any dumber than the rest, so we have not yet seen a flock that "won't" use the feeder but we have seen a dozen or so customers that "won't" follow the instructions and then claim their flocks are too stupid to use the feeder. Guess what? It isn't the chickens that are stupid. We wish to keep the cost of our feeders as low as possible and our feeder is a lower cost alternative to the very expensive Grandpa feeder so we do not wish to cater to customers that think they can order a feeder, try it out, and return the product. That drives the cost of doing business up dramatically. Nor do we wish to deal with the crazy OCD people that think a chicken feeder has to be built to Steinway piano standards, be produced in the U.S., and be sold at rock bottom prices. But if you want a less expensive solution to preventing wild birds and rats from stealing your feed, are intelligent enough to assemble the feeder or have someone that can do that or are willing to ask the five year old neighbor kid to assemble the feeder, then you are our kind of customer and you can order with confidence. Cheaper Shipping? Take a look at our two pack, three pack, and four pack feeder bundles. The more you ship the cheaper until you get to the oversize boxes. The four pack feeders will ship to California for around $12.00 per feeder. There is no such thing as cheap shipping, UPS, USPS, and FedEx Ground all charge a lot of money to deliver packages. All "free shipping" programs have the cost of shipping buried in the cost of the product or in the case of Amazon Prime they require sellers to inventory a lot of product at dozens of warehouses around the U.S. and charge enormous selling fees to cover shipping and handling costs. As an example, we once sold on Amazon which has a $12.00 selling fee and you have to bury another $12.00 on the average into the sales price to cover the subsidized shipping. If we still sold on Amazon and offered the free shipping or Amazon fulfillment the feeder would cost $89.00 plus shipping (15 pounds is allowed $12.00 on Amazon) for a total of $101.00 net price to the customer. Even if we used Amazon fulfillment the cost of warehousing feeders around the country and the cost of shipping the feeders to those warehouses would bring us right back to the same costs as shipping from our Oklahoma shop. A competing product sold on Amazon that holds the same amount of feed costs $99.95 but it has "free shipping", meaning you actually pay $34.95 for the shipping and selling fees. That product is the green plastic and sheet metal one and it is being dumped on the U.S. market after the Dutch company couldn't sell them in Europe due to design flaws that allow rats, wild birds, and squirrels to simply push the door open! This Dutch company is wholesaling them at $40.00 plus freight on a pallet of them and several retailers like Rentacoop and Hog Slat are key stoning them (doubling the cost). Hog Slat has a warning about the vermin being able to chew through the plastic parts of the feeder and the ability to push the door open, in bright red text but at the very bottom of the web page. The Amazon page for the product has a 30% critical (negative) reviews rating. It is a pretty feeder but it is also pretty bad. This feeder is radically different from the other feeders for four main reasons. First, no plastic parts that rats will eventuality chew through. Second the treadle is set way back on purpose so that if a critter or a pack of critters managed to get the treadle down when they went forward to eat they would lose the leverage and the door would close. Third, the door is spring loaded so it is nearly impossible for several rats to push it open. A dozen might do that, four or five couldn't. Fourth, the entire treadle and door is counter weighted at considerable expense with a 2# counterweight that ensures the door always opens and always closes. It also has a one piece steel treadle that won't flex and break like the riveted aluminum or plastic treadles. The Grandpa feeder is a nice feeder but three times the cost or our feeder. It is an outdoor feeder, we tell people that you should have some sort of rain cover if our feeder is used outside and the feed isn't emptied out by the birds every day or two. Some of our customers swear that their feeder does fine outside but water blowing against the door might drip down into the front edge of the feed tray. The Grandpa feeder is slow to ship and arrive due to the distances involved. It is also what is called a guillotine feeder that goes up and down instead of swinging back. That makes it hard to train the birds. To train a flock using the Grandpa feeder you HAVE to block the feeder open for a week or more. The Chicken Condo feeder has several clones out there, all with the same fatal flaws. The door isn't spring loaded or counter weighted so a mouse or rat can just push its way into the feeder. They have a complicated treadle step frame made of many sections of aluminum angle and metal fatigue and cracking ensue rapidly till the door no longer operates. Rats and pigeons can also swarm the treadle due to its large size treadle. The birds can't see the feed until they stick their head way up under the feeder. The door swings up, not back, so the potential for trapping a bird's head is high. The doors are complicated, many parts, and prone to wear and jamming in a dirty chicken coop. The marketing videos on these types of feeders advocate leaving the feeder blocked open for several weeks during training, not a good thing to do if you are buying a feeder because of vermin stealing the feed because it also teaches the vermin where the feed is and how to push the door open. Our feeder tried out the multi component treadle bar, the complicated arrangement for linkages fastened to the door to operate, and we quickly learned to eliminate both the complicated door and the multi part treadle due to the treadles failing rapidly. Instead we invested in the equipment to weld a solid steel axle, only one moving part, and nearly bullet proof. This also allows the spring loaded adjustable door that eliminates the possibility of several rats or a squirrel from pushing the feeder door open. None of the competing feeders have the 2# counterweight either which we found was essential for ensuring the feeder never failed to open or close completely. These Chicken Condo type clones were so bad for business that one company named Coops N More pulled their feeder from the market and it was an almost exact clone of the Chicken Condo feeder. Buyers should be wary. Read the reviews and if there are many critical reviews that is the best indication of a poorly designed feeder. The Amazon feeder has a 30% negative review rate but when you look at the company's profile they claim a 100% positive rate so they do have control over the ratings and reviews on Amazon.